If I had to define the word serendipity I would use this picture as an example. I shot this when I was on my way to Nebraska recently to see family, and as I often prefer to do I took back roads and highways instead of main roads and interstates. Those routes are often more direct as the crow flies but take a little longer due to reduced speed limits and small towns, but they more than make up for it (in my opinion) simply due to the scenic nature of the drive. Case in point: I had no idea that my trip through Kansas would end up taking me past a vast field of sunflowers, and because I was on a barely-paved two-lane highway I was able to easily stop, get out, and shoot some photos. First off: I don’t really want to say exactly where in Kansas I got this picture because of stories like this where tourists and Instagrammers overwhelmed and basically destroyed a similar location in Ontario. But it was definitely off the proverbial beaten path, and not at all something that most people would end up driving past. And as I got out my camera I quickly realized one problem: I had no idea how to capture this scene. When I first drove past the field on my way to Nebraska I got out my D750 + 70-200 lens because…well, I don’t really know why. I thought that it would be a way to capture the vast scene in front of me but when I got to my parents’ house and looked through some of my images I realized that even shooting at 70mm was far too narrow to really showcase the scope of the sunflowers, and my shots at longer focal lengths mostly looked like a yellow and green mess. Depth of field was all weird too, and even shooting at f/11 the DOF was so narrow that much of the sunflower field looked blurry and uninspiring. 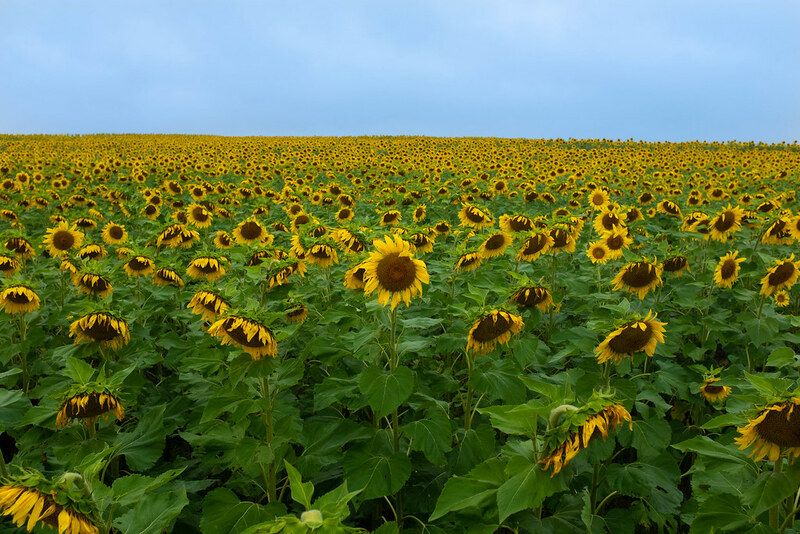 You did a beautiful job of capturing the breadth of the field of sunflowers. The sky really adds to the image. It paid off to revisit the scene to get the shot that portrayed the feeling of the scene. Thanks for sharing. Thanks Dennis! It was much more difficult to capture this scene than I thought it would be, and I hope I’ve learned a few things to help me next time I’m in this kind of situation.